The inherited disease Von Hippel-Lindau (VHL) syndrome results from loss-of-function mutations in VHL, which encodes a negative regulator of the hypoxia-inducible transcription factors HIF1α and HIF2α. Individuals with VHL syndrome commonly present with hypervascular tumors, renal cell cancers, and elevated levels of circulating rbc. Targeted therapies for VHL syndrome are currently limited, and surgical removal of tumors is often the only course of action. 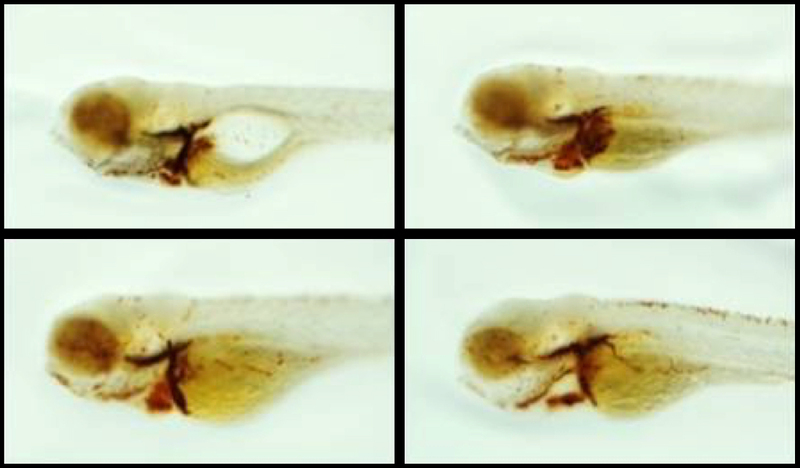 Ana Metelo and colleagues at Harvard Medical School developed a zebrafish model of VHL and demonstrated that treatment of these animals with a HIF2α inhibitor ameliorates VHL-associated phenotypes. Specific inhibition of HIF2α resulted in downregulation of Hif target genes and decreased vascular growth, circulating erythroid progenitors, and the incidence of heart defects. Moreover, HIF2α inhibition improved survival of vhl-deficient zebrafish. The results of this study indicate that HIF2α-specific inhibitors should be further explored as a therapeutic strategy for VHL syndrome. The accompanying image shows blood vessel development (O-dianisidine staining, brown) in WT zebrafish embryos (top left), vhl-deficient embryos (top right) and vhl-deficient embryos treated with either 1μm (bottom left) of 3.5 μm (bottom right) HIF2α inhibitor. Inhibition of HIF2α decreases the aberrant blood vessel sprouting and erythrocytosis observed in vhl-null embryos. Citation Information: J Clin Invest. 2015;125(5):1987-1997. https://doi.org/10.1172/JCI73665. Patients with a germline mutation in von Hippel-Lindau (VHL) develop renal cell cancers and hypervascular tumors of the brain, adrenal glands, and pancreas as well as erythrocytosis. These phenotypes are driven by aberrant expression of HIF2α, which induces expression of genes involved in cell proliferation, angiogenesis, and red blood cell production. Currently, there are no effective treatments available for VHL disease. Here, using an animal model of VHL, we report a marked improvement of VHL-associated phenotypes following treatment with HIF2α inhibitors. Inactivation of vhl in zebrafish led to constitutive activation of HIF2α orthologs and modeled several aspects of the human disease, including erythrocytosis, pathologic angiogenesis in the brain and retina, and aberrant kidney and liver proliferation. Treatment of vhl–/– mutant embryos with HIF2α-specific inhibitors downregulated Hif target gene expression in a dose-dependent manner, improved abnormal hematopoiesis, and substantially suppressed erythrocytosis and angiogenic sprouting. Moreover, pharmacologic inhibition of HIF2α reversed the compromised cardiac contractility of vhl–/– embryos and partially rescued early lethality. This study demonstrates that small-molecule targeting of HIF2α improves VHL-related phenotypes in a vertebrate animal model and supports further exploration of this strategy for treating VHL disease.